Home Arabic mehndi Easy Mehndi Desings henna mehandi History of mehndi latest mehndi white henna 35 Latest White Henna Designs That Will Look fabulous On Hands! 35 Latest White Henna Designs That Will Look fabulous On Hands! Social media is flooded with beautiful women sharing pictures of their hands and feet decorated with white henna designs, popularly known as ‘white henna’. A few months back when I was browsing through pictures of Boho Style I came across this beautiful body art. At first I thought white mehndi art was associated with hippie women or Bohemian babes . 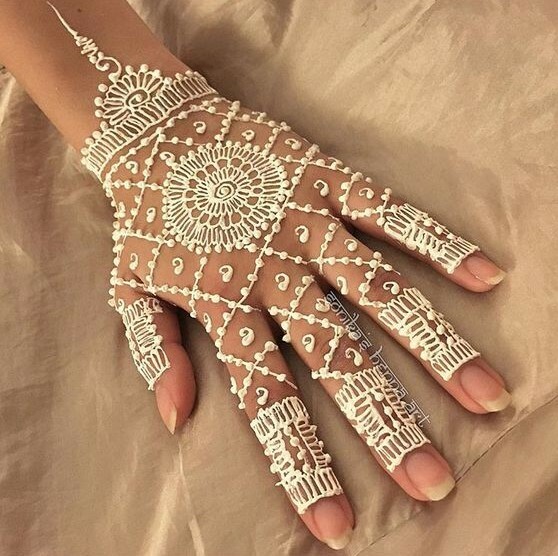 White henna does feel beautiful, lovely and free and hence we can understand why many boho inspired ensemble and looks have hands or any other body parts adorned with this decorative art. Later I saw many women sharing pictures of beautiful white henna on insta and pinterest, that is when I did a full research on what white henna was and where it was popular. White Henna’s Popularity & its Application! White henna does look like it was inspired by the traditional mehendi art in which the mehndi is removed completely which leaves a beautiful deep red or orange tint. These beautiful white patterned mehndi art can be great for wedding season or for those who want something different than the traditional mehndi art. Lets take a dig into what ‘White henna art’ actually is and where it was popularized. Henna art is very popular among Asian countries and is slowly becoming a favorite among the western fashionistas. Many of the bride’s in western countries have opted for temporary white hanna art to go with their beautiful white wedding gowns. The traditional henna art is where the mehndi or the henna paste is derived from henna plant leaves . The henna leaves are crushed, grinded to a fine paste and mixed with other natural ingredients like tea leaves and eucalyptus oil to give a fabulous dark color . The traditional mehndi stays upto weeks and leaves a tint which is red, brownish red or orange. But unlike the traditional art of applying henna with a cone white henna is applied with cosmetic white paste or a paint brush. It is actually surprising to see that white henna doesn’t have any significance to to henna mehndi at all. It is purely body paint and is temporary, very similar to the flash tattoos or Mica tattoos. But the patterns drawn are exactly like the ones we draw with traditional henna mehndi cones. White mehndi doesn’t stain your skin like the traditional henna made from henna leaves. What is White Henna made from? Have you always wondered what white henna is? White Henna is white in color with metallic or glitter accents on it. The white color unlike henna leaves is achieved with white body paint, white glitter and adhesive. The whole white henna look can also be achieved with white or metallic temporary tattoos. Intricate beautiful patterns are designed from acrylic or craft paint. If you have come across #WhiteHenna photos either on twitter or Instagram , then you must know that the white henna mehndi patterns are actually just face paint that washes off at the end of the day. You won’t find any white paint that will ever leave a stain on the body like the actual henna mehndi does. Body paint is a great way to decorate your hands with white henna or you could even use acrylic or craft paint to get this trendy look. Not to forget that white henna just lasts for the day. At the end of the day you have to part ways with the beautiful art as it is more of a temporary tattoo henna. If you are a mehandi person you definitely would have seen many people using and flaunting designing made from cosmetic craft paint. White henna is popular not just in the west but throughout the world. You must also have seen it in the hands of ladies at weddings or festivals. White henna is quite popular and an exciting alternative for people with darker skin tones as the white looks absolutely gorgeous on tanned skin. Usually glitter and mica tattoos are used to get the white henna look. We have already explained how to make the traditional henna mehndi. Now for the white henna you can make white henna cones and draw patterns from it on your hands. The desired white henna look can be achieved by mixing mica powder and adhesive face paint. You can even mix a layer of cosmetic paste and fill in the cones. While making a cone just make sure the cone is thinner unlike the staining henna cone . Secure the end which is open and make a very tight hole and start decorating your hands and feet ! the white henna designed hands would look even more stunning if it is followed by a dusting of good quality, safe glitter or any cosmetic glitter. another thing to keep in mind is to use a waterproof face paint as this way the beautiful white henna pattern will last for more than 24 hours! Take a sneak peek into our beautiful designs from which you can make a mehndi design book! Applying white henna is very easy. Just decorate your hands with these beautiful patterns I have listed below and dust glitter afterwards to create a stunning look. Below are the most beautiful white henna patterns you can create to make your hands look awesome. can’t get enough of them! Are you loving em too? If you are a bride to be than this is the perfect white henna design for you to try ! Instead of white gloves let your hands speak of beauty. The lace pattern looks beautiful when decorated with henna paint. The netted design gives the hand a lacey net look which is stunning! Henna art turns even more beautiful when there are flower patterns and this beautiful mehandi design with a huge lotus blooming out in the middle is exotic and perfect to sport for festive occassions. Darker skin tones can go for white henna designs as they look absolutely gorgeous on them! The below picture is a perfect example for it. With Pakistani arabic henna motifs this beautiful henna design is a must try ! Traditional henna that stains is decorated with swirls and is a favorite among many but when the same is repeated with white henna paste the beauty just doubles! You agree? I was spellbound when I found this extravagant design in a tattoo gallery ! You might need a little professional help to excel this beautiful design on your hands. Want something that is imple and fuss free yet stands apart? This design is the answer. Just put in two worded write up and viola, you have the perfect design in white henna to flaunt! Flowing white gowns when matched with staining traditional mehndi would definitely look odd hence this beautiful henna design is what you give a try if you are a bride and wearing a beautiful flowy white gown! Arabic mehndi designs and patterns are world famous, then why stay behind when trying them in the white henna form? If you want a girly soft floral touch in your mehandi and want it to be gorgeous then you can try rose mehndi design like the one below. Most of the bride’s can be seen flaunting lace gloves in the west on their wedding day to add to the elegant charm but in India brides flaunt their Henna patterned hands instead of covering them with gloves. IIf you are up for trying a lace patterned mehndi art for western outfits, this design is your answer. Paisleys and flower motifs are quite a favorite when it comes to henna mehndi art. The paisleys drawn on each side of the hand’s back are delicate and give a beautiful look. This henna tattoo with a traditional touch is perfect for ethnic wear or can be teamed up with a boho flared pants ! Arabic mehndi designs have been my favorite since childhood, a single bel9creeper) creeps from the finger to the arm. Super love this one. Just remember to use athicker white henna paste to get the desired effect. Undoubtedly mehndi is addictive, take inspiration from new fashion and style statements sprouting and get this latest henna tattoo on your arm! Arabic mehndi that looks like real jewelry? yes please ! Don’t forget to dust it with a glitter or any cosmetic shiny dust powder to make even more breathtaking! This is the simplest henna design. A perfect for those who haven’t mastered the art of drawing mehandi .The best thing about this design is that you can do it on your own. That simple! Use this mehndi as a form of expression for love! Incorporate the feeling of love with this stunning heart shape mehandi design. Try this henna design and make sure you place a few kundan stick ons in between the design to make it more attractive! This is beautiful but it could be damn hard to be done with cosmetic paint, its best to achieve this one with the help of a tattoo. Arabic mehndi which extends higher to the wrists and then even higher to the arms looks lovely on brides. This lovely pattern can be derived with the help of temporary white henna tattoos. One word to describe this mehandi design is 'Beautiful' Tanned arms and hands? No problem, now you get to decorate them with white henna! This minimalistic yet simple mehndi design is a must ry for those heading to the beach! It will go hand in hand with your beach wear! Boho chic is the way to go. Boho babes who accessorise with loads of rings and silver jewellery can go for this design as it looks fabulous with gypsy attire and bohemian attire. This is another beautiful design for beautiful boho ababes. Get set go get them ! This is one image I found on pinterest which was pinned form instgaram, and now you know what instagram has..its filled with beautiful women flodding phootos of their hands decorated with these exiquisite mehndi designs. Middle east gulf countries where designs are relatively more simpler have these geometric patters in them and are called Moroccan henna designs. Try them to get a very tribal look. Beautiful arabic henna art augments a woman’s natural beauty and the simple arabic patterns add a touch of elegance. This white henna piece of art will be a show stopper. Darker skin tones can try this latest mehndi design variation , delicate and minimalistic! What say? Decorating the back of hands is one trend that has caught up with woman then why not try some white henna designs on the back of the hands? With floral motifs this flower mehndi design is worth a try for auspicious occasions. Plus a design with floral motifs is pure love! The art of henna is born young. Nowadays kids love white henna too. But as we know kid’s don’t have much patience and can hardly wait this simple and easy design is perfect for kids. Don’t you agree this is the easiest mehndi design for kids? This beautiful mehandi design reminds me of rangoli powder, sure to look lovely on the back of the hands. The henna paste for this shouldn't be thick, a little runny consistency paste will do the trick to draw thick and lovely lines. You can find white henna cones on most of the fashion sites online. Many of the pictures floating on instagram white henna-inspired flash tattoos brought from these online stores. But if you are against stick-ons, you can get creative with cosmetic compound called “white henna” which is very similar to the original – minus the skin stain. The cosmetic compound comes in waterproof form too, which will last upto a week! Happy creative styling! White henna is definitely worth a try for those who loves to experiment and have a creative streak , its the best way to stand apart. In an interesting twist on traditional Indian henna tattoos, numerous beauty and fashion sites have started selling stunning white henna and you can see that its a favorite way of decorating and adorning skin with those who dress freely or who dress the boho way !